Home / Archive by categoryBeat Tinto Blog"
Saturday April 20th was the day we turned Tinto yellow! Thank you to everyone who came along both from the Beatson and from Body Morph Fitness. The sun was shining and the conditions were perfect. The hill was extremely busy but despite the heat I was up and down in 55.07min which is a new record. We are now 5 minutes ahead of the clock. It was mission accomplished as we raised more awareness for the cause and added over £600 to our existing total which will take us through the £1500 mark ! Brilliant thank you all for your continued support. Plenty of pictures to share this week plus drone footage will follow once it’s been edited. Best day of the year by far! That’s one climb ahead of schedule now too! Rolled out my secret weapon (Cal) again for his 12th climb and he got his best time of 57.06min that’s 10.30min back against the clock in the last 3 climbs! Only hazard today was the farmer burning off the heather Cal didn’t like that as we had to run through the smoke. Saturday’s forecast is also good so looking forward hopefully to another good time. Thank you you for all your continued support! Conditions were good for a fast time this week: mild, drizzle & no wind but you can’t even see the hill in the background with the haze & mist. It was first time back to back sub 60min with a time of 56.27min. We’ve now clawed back 7.30 min against the clock in the last 2weeks giving us a total of 15hrs 8min. Plan now is to be level with the clock by the end of the month! After 15 climbs we’ve now past the height of Everest as we reach the 30,000ft mark. The score is now 10-5 in the favour of Tinto. Hopefully by the 20th climb it will be 10-10! Thank you for all the continued support and sponsorship I couldn’t do it without it! 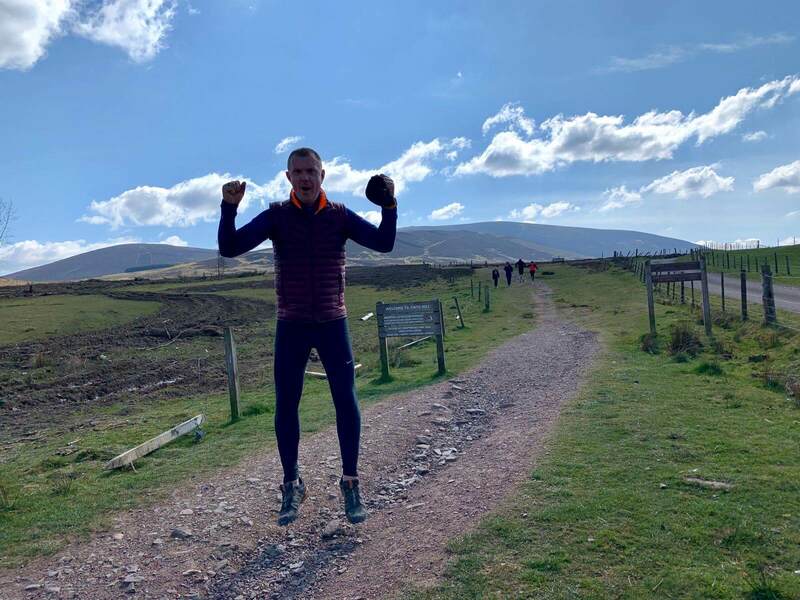 On the first anniversary of the La Concha fundraiser climb it was perfect conditions for the 14th Tinto climb this week. 56.03min a Personal Best by nearly 3min so the overall time is now down to 14hrs 11min. No Cal this week as he was resting, so huge thanks to Rod for pacing me and making me work harder! On Saturday April 20th we’re hoping to encourage as many people as possible to join us whether your just wanting the challenge of the hill or raising funds towards the charity. Weather permitting we will be filming the trek that week too. If you’re interested in joining us please get in touch for details of start times as they will be staggered based on ability. 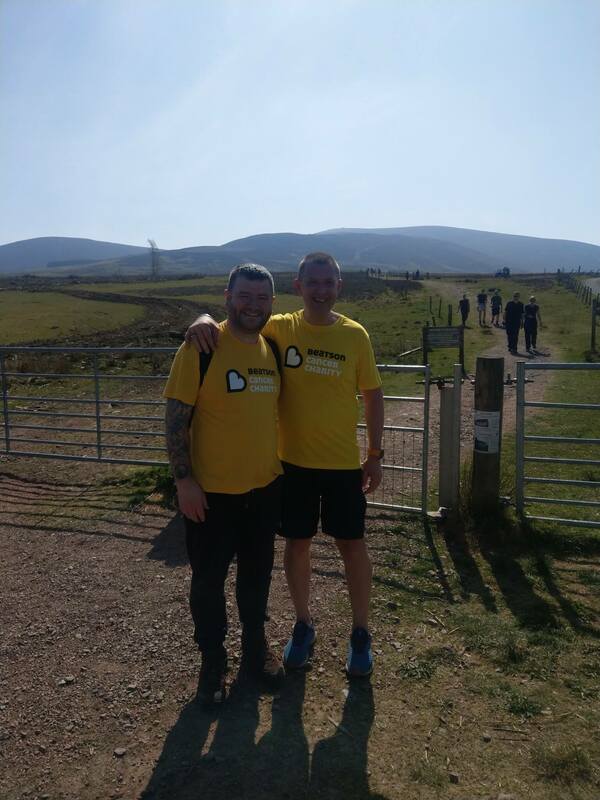 #T13 Beat Tinto For Beatson-Quarter of the way there! 25% of the challenge done !! 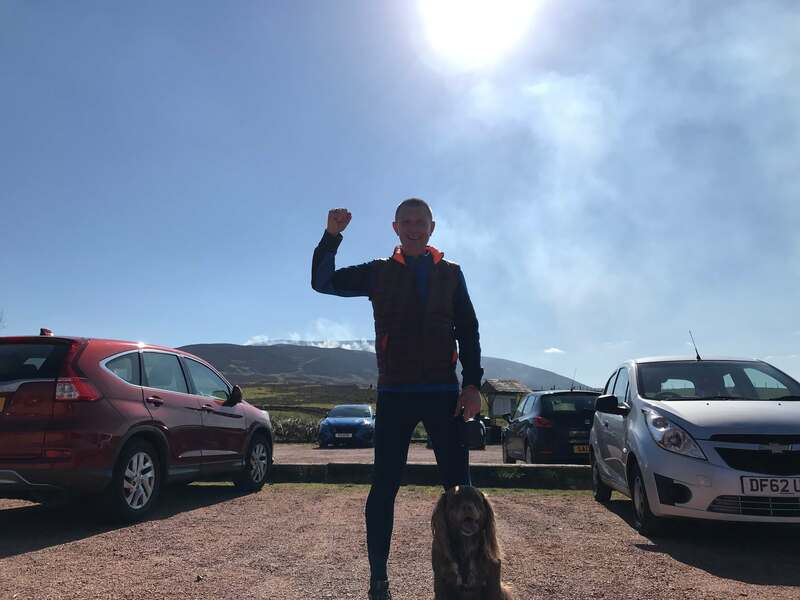 Probably the best conditions to date, respectable time but no records this week, super pup Cal was back from his rest and provided the much needed inspiration that was needed, felt like Nevis instead of Tinto, time clocked was 60.45min. Was hounered to be one of the guests at the Civic reception held at the Glasgow City Chambers this week to celebrate the Beatson Cancer charity which is now 5 years old. £20m has been raised and it was fantastic to be amongst so many volunteers & fundraisers. Once you’ve seen where the money goes and how it helps the patients and families it inspires you to help in any way you can. Weather conditions looking a bit more settled now so hopefully some faster times to come! FINALLY one back for the Morph Team, first sub 60 min in 7weeks. Despite the rain and the snow we clocked 58.50 min. The score now stands at 9-3 in Tintos favour and a total time of 12hrs 14min. 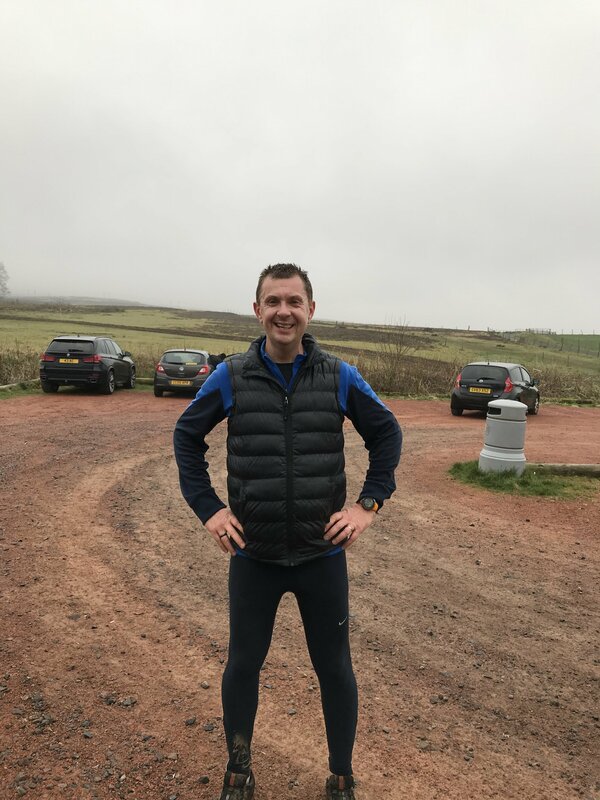 Thank you to Morph team member Andrew Macfarlane for pacing me up and down in such miserable conditions while my running partner Cal was rested for only the second time. Thank you to the sponsors that supported us on #T12 every penny makes a huge difference we have now raised over £600. Next climb takes us 25% of the way there and hopefully some better weather soon. Another week of difficult conditions this time snow & high winds, so it was time to get out my secret weapon and get Cal to pull me up & down yet again. As a result we were quicker than last week clocking 62.38min which under the circumstances I’m happy with. Faster times to come in the weeks ahead I’m sure. Again there has been a lot of support & encouragement this week so thank you very much for that, every pound donated motivates us to get up & down one more time. I was hoping the 10th climb would bring a record, unfortunately it brought the wrong type with the slowest time to date 65min 29 sec. Conditions were the worst yet with 75kph head winds and that was just at the car park, I had to crawl the last couple of meters to touch the cairn the wind was so strong. Over all time has slipped to 10 hrs 13min but I’m still confident I can make it back up. As it stands Tinto is winning 8-2 on the the time trials but as soon as the wind drops back down we’ll claw it back. It was a good week for my climbing buddy Cal to take a rest, thanks to Rod for pacing me and keeping me motivated! More sponsorship came in this week that’s what kept me going on Saturday thank you very much!